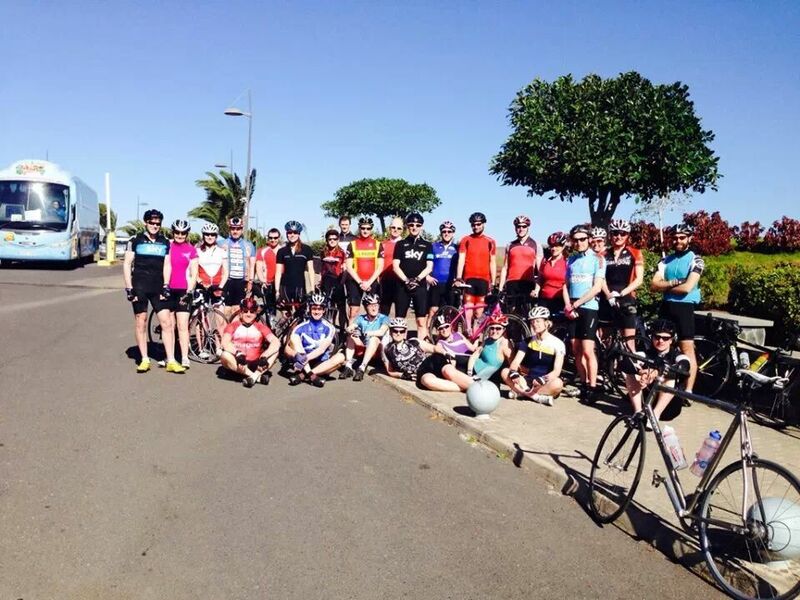 March 15, 2014 Jo H.
That’s the motley crew back from training camp in Fuerteventura, here’s a wee pic of us all on the first day before we headed out for a ride. This is a great trip, an opportunity to get in some miles on smooth tarmac in the sun when you’ve just about had it with Glasgow winter, coached swim sessions in a lovely 50m pool every day, swim filming, a chilled Sunday with Tai Chi and Yoga, run session options, opportunities for one to one coaching sessions with the fabulous Vicky and, not to forget, lots of fun and banter! Just ask Ian Ramage how many sleeps it is ‘til next year…. – The Allander junior aquathlon is on 23rd of March and could still do with a couple more bodies if anyone else is willing to volunteer? No experience necessary, opportunities to go cycling or running from there afterwards. – Since I’ve mentioned juniors, some of the coaches held a ‘Comealongathon’ on Sunday 10th March and had 16 kids turn up at Clevedon school for a wee triathlon experience, sounds like it was a great success! If you have kids or know of kids who are interested in triathlon, we do juniors sessions on a Tuesday and Thursday evening, contact me for more details. – The first super summer series intro ride is on Saturday 22nd March, this will be a ride to Stewarton and back, approximately 30-35 miles. Meet at Pollok country park for 8:45 to be ready to roll at 9am. Further details at the linky. – Western baths is closed on Sunday 30th March as part of it’s annual closure – there will be NO SUNDAY SWIM on this day (they’re having a concert in the pool….in the actual pool! Drained obviously…). At Pollok Park parkrun, Mark Cohen ran 24:55. Mark reliably informed me that Tollcross is his favourite parkrun, a small field of approximately 60, you get a wee cake (or was it biscuit?) at the end and a cup of milk (for free! ), plus you are ideally located to trot along to Tollcross pool for a post-run swim. There was a bigger GTC turnout at Victoria Park parkrun with Stephen Macintyre running 20:00, Derek Sommerville 22:53 and Andrew Cruickshank 24:47. Also racing on Saturday: at Victoria Park parkrun 5km was John Kinsella 22:18, Andrew Cruickshank 24:11 (another PB!) and Daniel Burczyk 26:30. Nicola Milligan finished Pollok parkrun in a new PB of 23:51 and Paula Regener completed Edinburgh Parkrun in 22:45. And the final roundup, racing the Balloch to Clydebank half marathon (a point to point route), results as below. I believe Derek’s time was a ?13 minute PB! Top effort! That’s all from me folks, be sure to send in any race results/reports or any other chat you want to share. Feel free to ask questions too. Have a great weekend up in Aberfeldy to all those heading there for this weekend’s training camp.